In Just USA jeans, it means you will fit a size 3 if your waist is approximately 23” inches around. But if we’re talking about Skunkfunk, you’re probably a 27 – 29” inch waist. 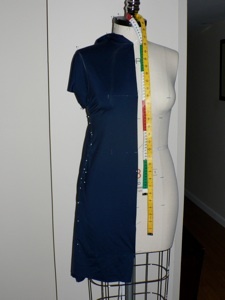 Every fashion brand decides at some point what dress form or block to use when they construct their garments. If the line is using old dress forms made from measurements garnered from the 1930’s (no joke), then you’ll probably feel like an overgrown amazon goddess when you put on one of these dresses. If you put on a dress from say, Skunkfunk, which appears to use a dressform designed from the newer measurement study, then you’ll feel like a wonderfully shaped modern woman of average to tall proportion. So each line, uses different dress forms. At our store, we will have a good idea which lines will suit your fit. Now if you find you love the look of a line but not the fit, your tailor can work miracles. Just remember to fit the largest part of your body and have them take in the rest. You can’t fix a piece that is too small but you can always take in a piece that is too wide or too long. Once you make peace with tailoring, your apparel world will open up.